A baseball in flight is subject to three distinct forces. The first is gravity, which causes the ball to accelerate vertically downwards at . The second is air drag, which impedes the ball's motion through the air. The third is the Magnus force, which permits the ball to curve laterally. Let us discuss the latter two forces in more detail. As students who have attempted to reproduce Millikan's oil drop experiment will recall, this force is the dominant drag force acting on a microscopic oil drop falling through air. However, for most macroscopic projectiles moving through air, the above force is dwarfed by a second drag force which is proportional to . where the drag coefficient, , is a dimensionless quantity. Here, is the typical length-scale (e.g., the diameter) of the projectile. For sufficiently small Reynolds numbers, the air flow immediately above the surface of the projectile remains smooth, despite the presence of the turbulent wake, and takes an approximately constant value which depends on the projectile's shape. However, above a certain critical value of --which corresponds to for a smooth projectile--the air flow immediately above the surface of the projectile becomes turbulent, and the drag coefficient drops: i.e., a projectile slips more easily through the air when the surrounding flow is completely turbulent. In this high Reynolds number regime, the drag coefficient generally falls rapidly by a factor of between 3 and 10, as is increased, and then settles down to a new, roughly constant value. Note that the critical Reynolds number is significantly less than for projectiles with rough surfaces. Paradoxically, a rough projectile generally experiences less air drag, at high velocities, than a smooth one. 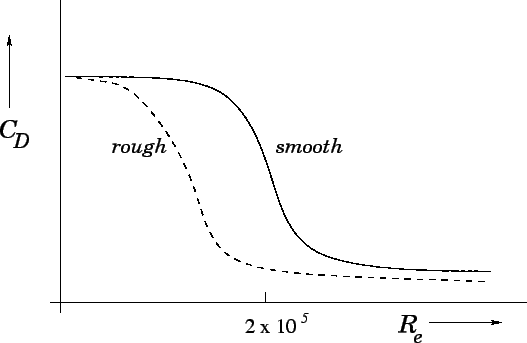 The typical dependence of the drag coefficient on the Reynolds number is illustrated schematically in Fig. 10. Figure 10: Typical dependence of the drag coefficient, , on the Reynolds number, . 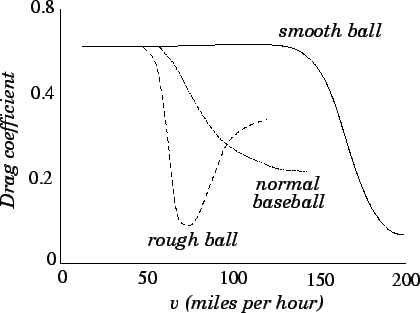 Wind tunnel measurements reveal that the drag coefficient is a strong function of speed for baseballs, as illustrated in Fig. 11. At low speeds, the drag coefficient is approximately constant. However, as the speed increases, drops substantially, and is more than a factor of 2 smaller at high speeds. This behaviour is similar to that described above. The sudden drop in the drag coefficient is triggered by a transition from laminar to turbulent flow in the air layer immediately above the ball's surface. The critical speed (to be more exact, the critical Reynolds number) at which this transition occurs depends on the properties of the surface. Thus, for a completely smooth baseball the transition occurs at speeds well beyond the capabilities of the fastest pitchers. Conversely, the transition takes place at comparatively low speeds if the surface of the ball is rough. In fact, the raised stitches on the otherwise smooth regulation baseball cause the transition to occur at an intermediate speed which is easily within the range of major league pitchers. Note that the magnitude of the drag force is substantial--it actually exceeds the force due to gravity for ball speeds above about 95mph. Figure: Variation of the drag coefficient, , with speed, , for normal, rough, and smooth baseballs. From The physics of baseball, R.K. Adair (Harper & Row, New York NY, 1990). The above discussion leads to a number of interesting observations. First, the raised stitches on a baseball have an important influence on its aerodynamic properties. Without them, the air drag acting on the ball at high speeds would increase substantially. Indeed, it seems unlikely that major league pitchers could throw 95mph fastballs if baseballs were completely smooth. On the other hand, a scuffed-up baseball experiences even less air drag than a regulation ball. Presumably, such a ball can be thrown faster--which explains why balls are so regularly renewed in major league games.